Trained in Design and Ceramics, with an MFA from Otis Art Institute, Steven McGovney has worked in multiple medias, but focused on the sculptural side of ceramics. 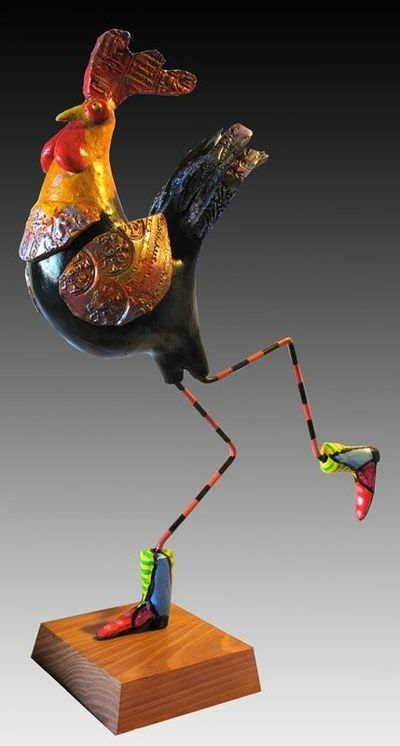 He has done both whimsical ceramic art, and sculpture. McGovney added designing jewelry to his interests, creating affordable designs in base metals and paper, and also a line of sterling silver and semiprecious stones. He was nominated for a NICHE award in 2010 for the silver and stone category. McGovney has also trained in lapidary, and cuts most of his own stones for use in his jewelry. McGovney and Tammy Camarot, created a successful line fo woldly painted table top items and one-of-a-kind sculpture. He has designed industrial lines for major retailers, incorporating fine design and affordable prices. He shows in many of the top galleries featuring American Crafts in the USA, and participates in several invitational shows throughout the country each year. McGovney currently teaches ceramics at Yavapai College, in addition to his studio work.